1. Determining the Thrust Vector in Relation of the Surface during Start. This angle is very important for the easy start of your paratrike. The idea is the following: when the paraglider is lying on the ground during the start and the engine is idling, the stream created by the propeller should pass over the paraglider and should not blow directly into the wing. If the stream is directed into the wing, it will be very difficult to start, because the wing will start flapping instead of blowing up. Typically the angle varies between 5 and 9 degrees depending on the type and diameter of the propeller. For small propellers located 50 centimeters off the ground, 5 degrees tend to be enough while for 1.60-meter propellers 25 cm off the ground sometimes even 7 degrees is not enough. Getting the propeller’s thrust vector right in relation to the point of suspension of the wing is crucial for take-off and flight safety. You need to have a very good grasp of the process when you design your aircraft. Please look at the illustrations. During horizontal flight, the propeller should be perpendicular to the direction of travel. This will eliminate the so called P-Factor (there is plenty of information about it on the Internet). This is important for the smooth operation of the propeller. 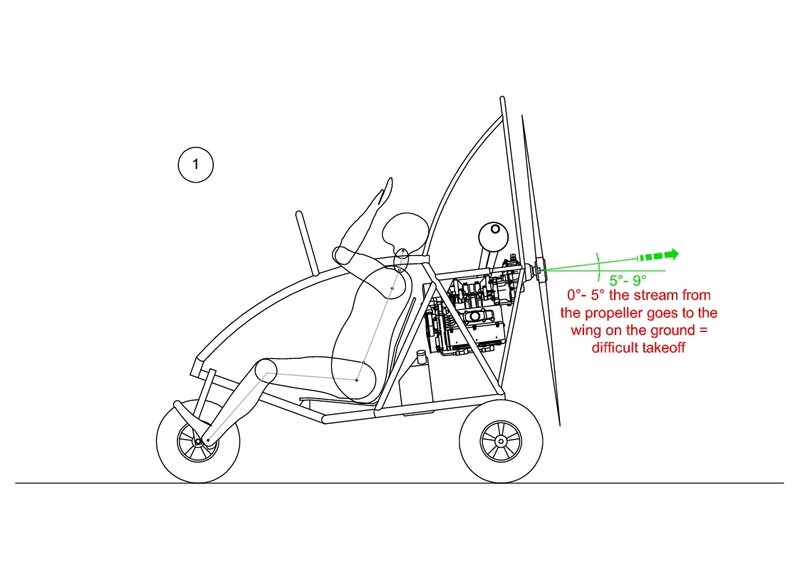 Having the propeller at right angles to the air stream is not achievable in all flight modes, but when the ppgtrike is in a horizontal-flight mode, this is usually enough. When it comes to the overall center of gravity, the lower it is, the better. Paratrikes with low centers of gravity are more difficult to flip during tekeoff. 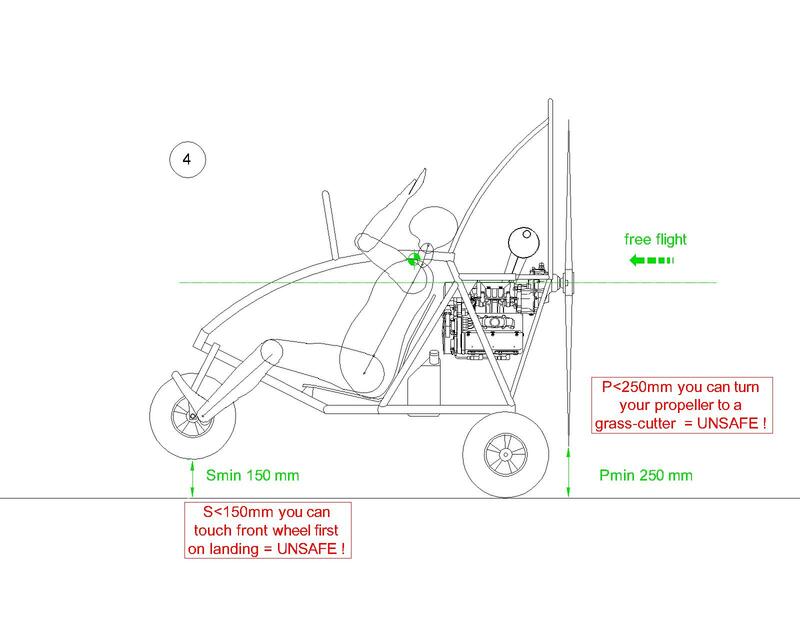 In terms of balancing your ppgtrike, you must suspend the trike and balance it before your first flight. 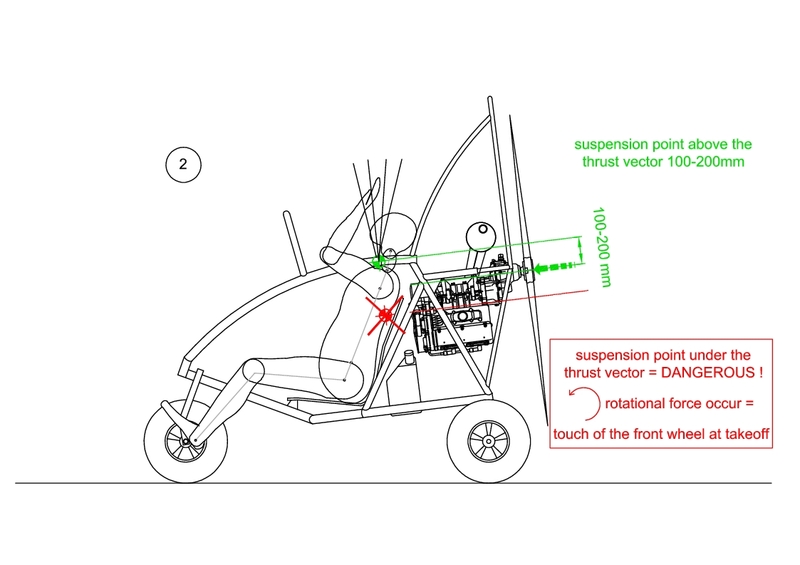 The plain of the propeller should be vertical when trike is suspended in full flight readiness mode (with pilot, fuel, rescue systems, etc. on board). This way, if you need to make adjustments after your first flight, they should typically be minor. Balance is crucial for flight safety. The rear axle should be positioned as far back (as determined by the direction of travel) as possible but ahead of the propeller. Usually 10 centimeters in front of the propeller is considered normal. 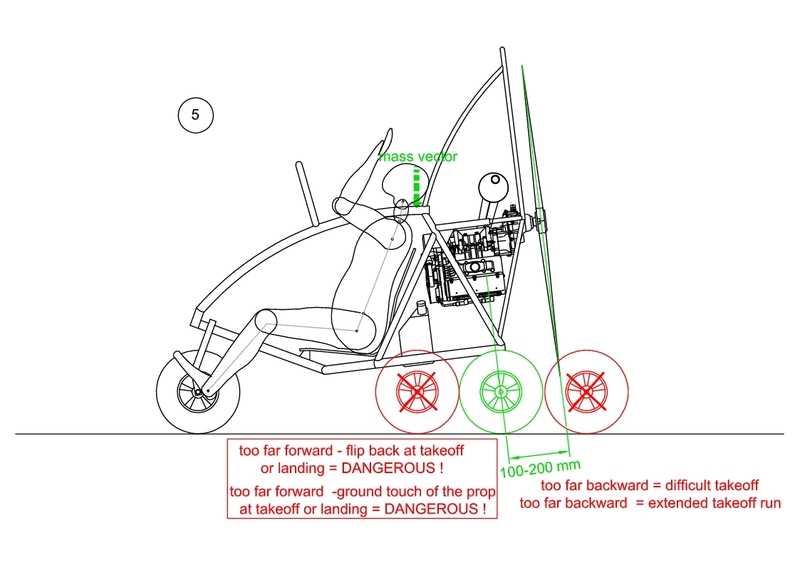 If the rear axle is too far forward, during take-off or landing the paraglider may pull the paratrike back and flip it over. 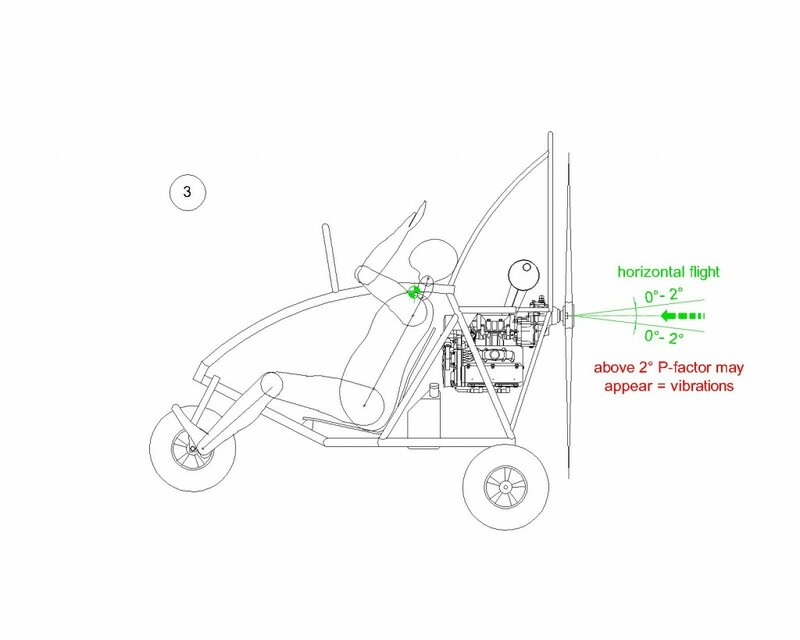 Conversely, if the back axle is behind the propeller, taking off becomes more difficult and the paratrike requires a longer runway. The length between the risers depends entirely on the paraglider you wish to use. If no information is available from the manufacturer, 60 centimeters is considered enough for single-seat powered paragliders. For tandem paragliders or heavy-duty powered paragliders the standard is 65 – 70 cm. If the length between the risers is over 70 cm, you will find that the tubing gets in the way making the controls harder to reach. 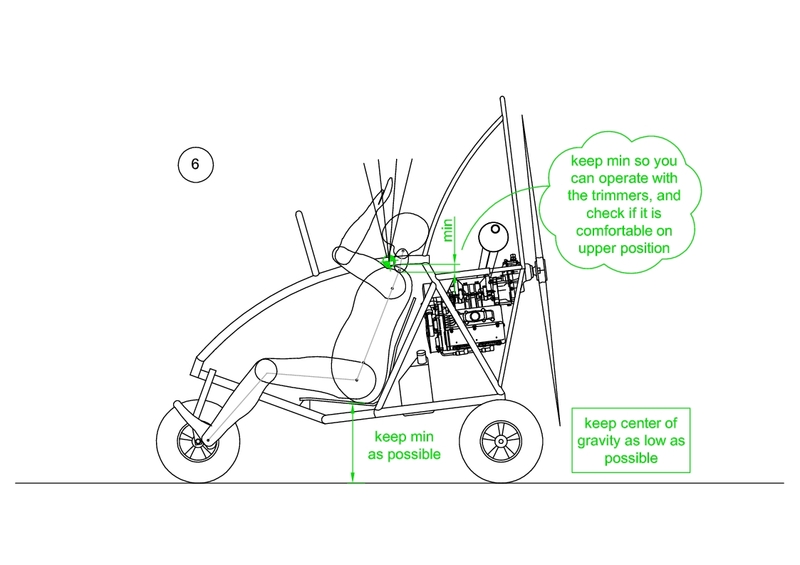 Seat height and hand positions are determined by the wing risers and trimmers. If your only consideration here is center of gravity, then the lower is the better, but there is another important aspect to consider. Powered gliders and tandem paragliders typically have trimmers. You must make sure that with the trimmers settings on max speed , you are able to quickly and easily get the controls or pull the trimmers . With the controls in the full up position and the trimmers on max speed your shoulders must not bump against the paratrike’s tubing. It is very important to check that to ensure that your flight will be as comfortable and as smooth as it could possibly be. This check is also very important for reflex wings because with them the stroke of the trimmer tabs is longer and the additional reflex-mode controls go farther up. Check how thing will fit and do not forget to take the length of the carabiner and the length of the trike suspension trips. This key design aspect is sometimes overlooked even by renowned manufacturers. During the start process, it is very important to tilt your head back and to look at the wing slightly behind. This makes starting easier. When you fly a paratrike, you have no feedback from the wing through the harness. Control is much more visual during the starting process so being able to see the wing is very important. The space over your head must be clear of tubing, tanks or any other similar obstructions. This depends on the wing type and your flying skills, but having A-strap assistance would surely make your life easier. During powered flights you need to control engine throttle as well so you should take this under consideration. 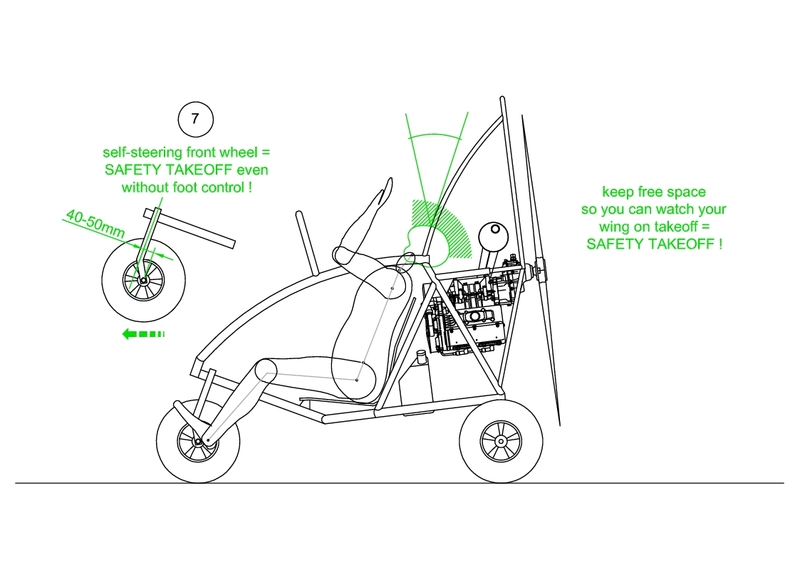 Self-steering front wheel helps you for safety takeoff. If you lose the foot control, the trike will continue in the right direction.